The above car ferry is being constructed by Bart Bakker, who lives in Utrecht, Netherlands. At the left, it’s a conventional FREMO module that connects with other modules and represents a ferry apron. But the right end is something Completely Different. It’s a Walthers car ferry, sitting on a waterway 68 cm long. It has a magical property — it can cross the Atlantic Ocean and carry railroad cars from the U.S. all the way to the Netherlands and beyond! For that reason, Bart has named his module the Atlantis Port Ferry. 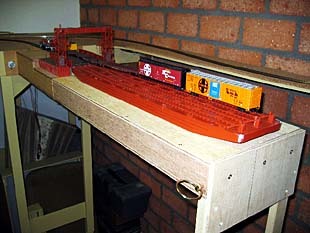 Shown at the top of the page is a switching locomotive loading a pair of box cars on the float, using three idler flat cars. Naturally, the heavy loco isn’t permitted on the floating barge! And the car ferry part of this module has another surprise in store. It was originally designed to be used in a permanent, around-the-room layout with a docking point for visiting FREMO modules. However, the layout’s owner changed his room entrance to eliminate the duckunder, and constructed a large bridge on wheels that is moved out of the way when someone needs to enter or exit the room. And guess where the only parking place for the bridge is located? Yup, right in front of the FREMO docking position. In fact, there’s only about 45 cm clearance between the bridge and the benchwork. So Bart’s ferry module is designed with a 42 cm apron — and a 68 cm waterway that can easily be folded out of the way when necessary! 1. Above left. Car ferry in place. Switching loco has withdrawn. 2. Above right. Ferry is lifted away and stored safely out of harm’s way. 3. Above. 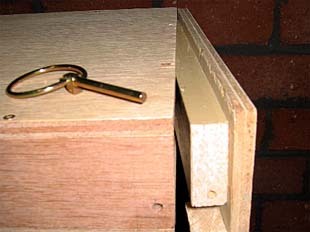 Pin locking the leg structure in place is pulled, and inserted in a convenient hole in the apron, blocking the entrance turnout to the ferry. 4. Right. The “water” is swung down out of the way, allowing the room entrance bridge to be rolled into position. Total elapsed time: about 30 seconds. Brian Wilson, who lives in British Columbia, Canada, spotted this Rubbermaid storage container that his wife uses for craft supplies. 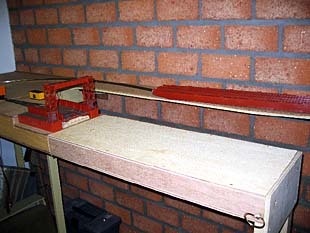 It measures 22x16x6.5 in (56x41x16.5 cm). What better place to build a micro layout? And what better layout to use than my A3 Sized Inglenook plan? In fact, the storage box is a bit larger than A3 size, allowing Brian to have slightly bigger curves and somewhat longer sidings. He drew up the sketch shown here to give you the idea … with luck we’ll have photographs soon of the finished layout! In England, Alastair Inskip has been studying my Midnight Flyer design, with an eye to using stagecraft to change the track plan each time the flying scenery is used to change the railway’s venue. He came up with two plans to achieve this magical change: (1) Use an extra-long baseboard with two different plans on it, and slide the board back and forth so the audience sees the track that matches the scene being shown; OR (2) Save length by dividing the baseboard in half lengthwise, and sliding each half to form a different plan when the scenery changes. It takes some study to understand this diagram. The green box is the visible “on stage” area. 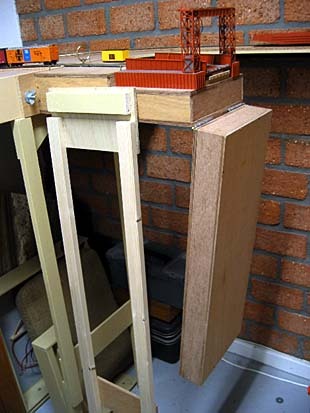 Alastair has added two feet to the layout’s length, and split the baseboard in half lengthwise. Two distinct track arrangements can be achieved by simply sliding the halves — one resembling a Timesaver switching game, the other an Inglenook switcher. Obviously, some more design work is needed, but Alastair’s idea is quite original. Anyone have more ideas or comments? Operation would be a little easier. The loco can push a car from the sector plate into the building and uncouple. The traverser invisibly moves the car to the rear, replacing the track with another — whereupon the loco moves through the building. The traverser then returns the car to the main, the loco couples on, and an easy runaround has been achieved! The alternative, as envisioned in the original plan, is simply to remove the car from the track by hand to allow the loco to run through the building. 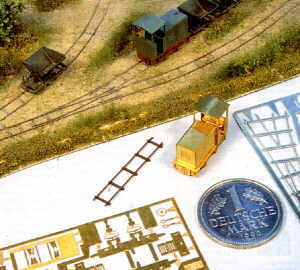 John’s suggestion is packing a lot of paraphernalia into a very tiny layout — but it looks like it would work quite well. The same stunt could be used with passenger carriages in layouts such as Union Station. IF YOU THINK N TRAINS ARE SMALL, MEET Nf! Frédéric Gantier, from France, has just completed another in his series of very small vignettes. This one is built in Nf scale (“f” stands for “feldbahn”, the German term for small industrial or “field” tramways). 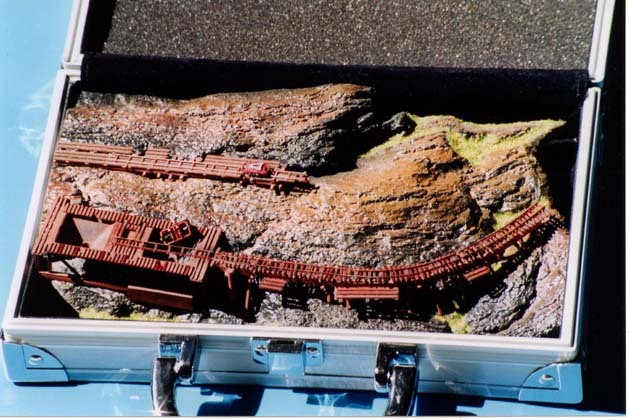 The gauge of Frédéric’s layout is 3.75mm (a little over 1/8″), and it represents a 600 mm gauge (about two-feet) mining prototype in 1:160 (N) scale. 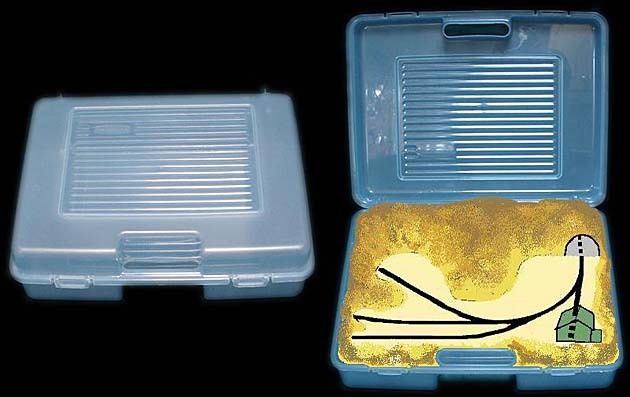 The layout is built in an aluminum paint box measuring 200x150x50mm (8x6x2 in). Track is from Railino, a maker of Nf European-prototype trains. Here’s a photo of some of their offerings. These tiny trains are amazingly detailed. To learn more about them, there’s an online catalog. Frédéric also passed on a couple of scenery tips. The trestle is made with N country fences. The terrain comes from an aquarium resin decoration used for simulating rocks. M. Gantier has no website, but you can reach him by email. I like the way you can just keep going without any stops. Keep the work going.